The 14 statues of laughing men that have greeted visitors to Vancouver's English Bay Beach have been saved by a $1.5 million donation by Lululemon founder Chip Wilson. The bronze sculptures have been a popular, but temporary, attraction at the corner of Denman and Davie Streets in the city's West End after they were placed there during the Vancouver Biennale two and a half years ago. But the future of the sculpture, called A-mazing Laughter, was in jeopardy because it was only on loan from the sculptor Yue Minjun as part of the bi-annual public art exhibition during the 2010 Olympics. Lululemon owner Chip Wilson and his wife Shannon donated $1.5 million for the Park Board to buy the statues, after their creator dropped his asking price from $5 million. 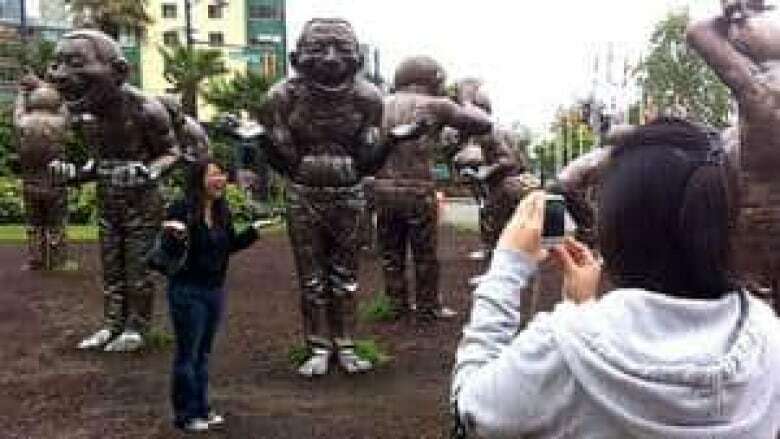 The artist said he decided he wanted the statues to remain in a public space in Vancouver after seeing photos of visitors interacting with them. Miriam Blume, the director of marketing and business development for the Vancouver Biennale said she was overwhelmed by the news. "It is really is quintessential Vancouver and it will continue to be the iconic piece of public art that it quickly became in the last two and half years," said Blume. "There is something magical about this sculpture that just taps into our imaginations and I think it gives us permission to be childlike and playful," she said. The park board had confirmed an anonymous donor had come forward to save the statues in March, but the final decision was only approved on Monday night.